Nuts are an on-the-go snacking staple, yet they are also potentially deadly to a small fraction of the UK population. So is it time to crack down on eating nuts in public and if so, where should we start? About two million people in the UK have a food allergy, with fish, shellfish and nuts among the most common types. For most people, the symptoms are mild - such as an itchy mouth or a rash - but in extreme cases, it can result in difficulty breathing or a potentially fatal anaphylactic shock. More than 25,000 people were admitted to hospital in England for allergies between 2015 and 2016 - a third higher than four years earlier - and the number of people treated for anaphylactic shock is also on the rise. So as the family of one young woman, Amy May Shead, who was left severely brain damaged after a reaction to nuts, campaign to have them banned on planes, is it time to take action? Becky Gittins, 22, is about to start her first full-time job as an accountant and says she is already nervous about her first day. Becky, a Warwick University graduate, also has a severe peanut allergy which can provoke anaphylaxis - a life-threatening allergic reaction. "My manager asked me about it this week, and I said I'd bring my own lunch, but she told me she had the same allergy and they do her a box of salad separately. "That makes me much more reassured about that first day." But she says work events "make me quite anxious", adding: "There's nothing worse than those dinners when they ask, 'Why have the serving staff spoken to you?' and the whole table for an hour is talking about it." She adds: "I noticed the office eats Hersheys Kisses which I think have nuts in them, so I'm going to have to be quite careful." Employers have a duty under health and safety law to protect your health, including allergies, but only as far as they "reasonably can". Supporters of a nut ban on flights argue allergy sufferers are at risk from airborne peanut particles - recirculated around the aircraft - and far from medical help in the event of emergency. However, most major airlines cannot guarantee a nut-free flight. Some - including EasyJet and Virgin Atlantic - say cabin crew can make an announcement if a passenger asks them to beforehand. Vanessa James, a nut-allergic investment banker who travels for work, says flying has become "more difficult". Now 37, she has lived with the allergy for nearly two decades and suffered six anaphylactic shocks. "These days they won't make those announcements, and if they serve peanuts they won't not serve them that day." 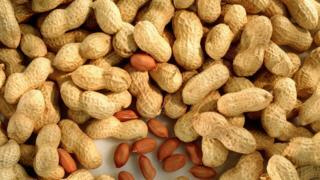 But a total nut ban is "impractical" to enforce, says Amena Warner, head of clinical services at charity Allergy UK. "Even if the airline did not carry or serve nuts, it would be virtually impossible for them to check whether their passengers have brought nut products with them onto a flight," she says. Amena added that if someone ate nuts earlier in the day, then boarded the plane, there could still be a contamination risk. So should we avoid eating peanuts on all forms of transport? Many trains sell nuts on board and passengers may have already brought their own snacks. TransPennine Express, for example, said it sells nuts and would not offer an allergen-free carriage, while Virgin Express said it could not control what foods customers bring on board. Becky says: "I'm constantly having to get up and move on trains if someone opens a bag of peanuts and my lips begin to tingle. "I think it's really irresponsible for train stations and airports to actively sell nuts," she adds. She thinks people are generally understanding if she asks them to stop eating nuts. "I do feel like a massive square. Usually, I keep another snack in my bag just in case - they could be a diabetic," she says. Vanessa adds: "I'll normally just move carriage, to be honest, it's not their fault they're sitting next to someone with an allergy." She says everyday situations can be just as dangerous. "Five years ago a friend kissed me on the cheek, and she'd been eating a Snickers - when it kicked in I went into anaphylactic shock." About one in 50 primary school-age children is affected by a peanut allergy, which has prompted some schools to ban peanuts and other foods in the canteen, staff room and playground. A primary school in South Wales recently implemented a "no chocolate policy" because of one boy's allergy, telling parents: "All areas of the school will be chocolate-free." And while schools have been known to ban some foods for health reasons - such as fruit juices - another school prohibited birthday cakes in case any of the ingredients contain allergens. But Geoff Barton, general secretary of the Association of School and College Leaders, says a no-nut school or nursery "would not reflect the reality of the outside world". He says: "It would be difficult, if not impossible, to enforce a total ban on certain foods in school." He suggests a "whole school awareness" approach instead, where staff and pupils know how to deal with allergic reactions. So maybe it is up to snackers themselves - rather than organisations - to think twice before opening a packet of peanuts in public.